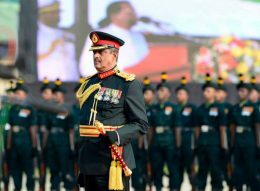 Leaders of the Liberation Tigers of Tamil Eelam, including Pottu Amman and Soosai during the final war, have been killed, according to former army commander and parliament member, Baldmarshal Sarath Fonseka. In this situation, there is no truth in the opinion that Pottu Amman is alive in Norway. "On the 19th of May 2009, the Nandikadal area was brought to war. The bodies of leaders including Prabhakaran and Soosai were recovered from there. However, the body of Pottu Amman was not restored. The body of his wife was restored. On the morning of May 19th, there was a fight with Prabhakaran's son Charles's army in the east. Prabhakaran tried to escape with the five men to the north coast. There is a pump.It was also there. Pottu Amman killed a suicide bomb in the shooting at this time. This information is KP. Released. Pattu was in the final stages of the war with Prabhakaran. He did not flee to Norway. We believe he died. In the meantime, we had Karuna staying in Colombo with military security in the course of the war. After the war, we took him to Nandikadal area to identify the members of the LTTE. "